After a week of non-blogging it is good to be back. It was nice getting a few more things crossed off my "to do list" Though I didn't finish as much as I would have liked, I'm sure that is a good thing as sewing is not something to be rushed, nor am I one who enjoys working at a frantic pace. My dh was a so helpful keeping the kidlets busy. It was sort of weird having so much time on my hands. Of course it wasn't all play and no work, crisis erupted predictably around meal times when dh just wasn't sure what to cook (or how to cook it ;) We also distracted ourselves with a few car rides out and about, discovering new areas outside our city while dreaming of the future (perhaps a future post discussion). Our weekend was a steady flow of celebrations. My niece's son turned 1 yrs old and the party was on Friday. I decided to make him a book tote to house the DK touch & feel book I had for him. 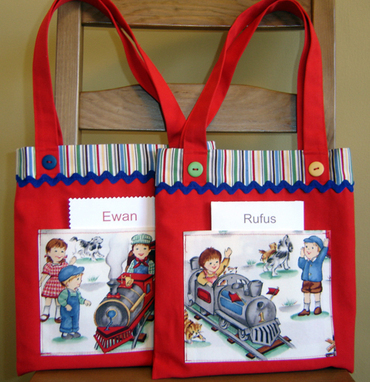 He also has an older brother who will be 3 in a few more months, so it only seemed natural to make a second tote. The totes are fairly identical and made with a canvas weight red fabric. 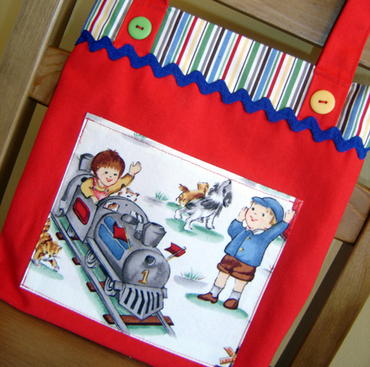 The train fabric, as well as the striped fabric are both Michael Miller retro favorites that I've been dying to use for ages. 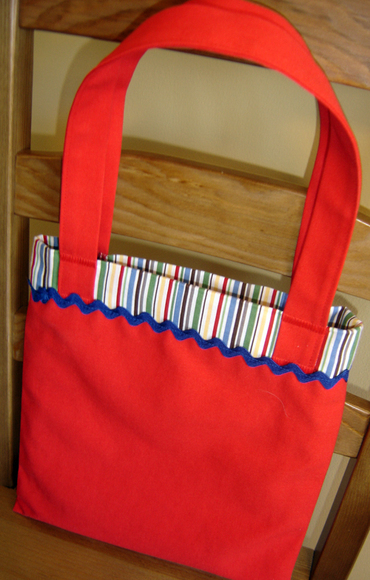 I lined the tote on the inside with the striped fabric, I love, love, love the weight and feel of that fabric. I finished off the totes with rick rack and colorful buttons. I hope those little boys enjoy filling their bags with books, toys and all sorts of activities as they grow while exploring their environment. And now I'm off to savor a good cup of coffee in hopes to awaken me, while I listen to the constant flow of ideas & conversations that flow out of the mouths of my wee ones in the early morning hours.